Get personalized one-on-one instruction from our world-class trainers through the ARCHICAD Concierge program. Eugenio Fontan - Business Processes, Finding Work Internationally, Innovation, Shell tool, Morph tool, Curtain Wall tool and Facades, Stair tool, Railing tool, Interactive Schedules, Lists, Properties & Classifications, BIMcloud & Teamwork, Energy Evaluation, Hotlink Moduling, Rendering, BIMx, 3D Documents, Graphic Overrides, Rhino & Grasshopper, Renovation, Modeling Tips & Tricks, Drafting Tips & Tricks, Attribute Management, Favorites & Element Transfer, Views & Layouts, Publishing, Work Environment, New ARCHICAD 21 & 22 Features. Márta Molnár - Stairs & Railings, Expressions, Shell tool, Morph tool, Curtain Wall tool and Facades, Stair tool, Railing tool, Window tool, Properties & Classifications, Expressions, Labels, BIMcloud & Teamwork, Collision Detection, Hotlink Moduling, Project Markup, BIMx, 3D Documents, Graphic Overrides, Renovation, Modeling Tips & Tricks, Drafting Tips & Tricks, Attribute Management, Favorites & Element Transfer, Views & Layouts, Publishing, Work Environment, New ARCHICAD 21 & 22 Features. Ákos Karóczkai - Grasshopper & Rhino, Cinerender, Shell tool, Morph tool, Curtain Wall tool and Facades, Rendering, BIMx, 3D Documents, Graphic Overrides, Rhino & Grasshopper, Point Clouds, Modeling Tips & Tricks, Attribute Management, Views & Layouts, Publishing, New ARCHICAD 21 & 22 Features. Monte Chapin - Business processes, GRAPHISOFT initiatives and ‘big picture’ solutions, IFC, DWG Translation & XREFs, BIMcloud & Teamwork, Collision Detection. Chuck Kottka - BIM Management, BIMcloud & Teamwork, Window tool, Interactive Schedules, DWG Translation & XREFs, Hotlink Moduling, Renovation, Modeling Tips & Tricks, Drafting Tips & Tricks, Revision Management, Attribute Management, Views & Layouts, Publishing, Work Environment. James Murray - GDL, Library Management, Shell tool, Morph tool, Railing tool, Window tool, Interactive Schedules, Properties & Classifications, Labels, Import/Export Property Data via Spreadsheets, Hotlink Moduling, BIMx, 3D Documents, Graphic Overrides, MEP Add-on, Renovation, Modeling Tips & Tricks, Drafting Tips & Tricks, Attribute Management, Favorites & Element Transfer, Views & Layouts, Publishing, Work Environment, New ARCHICAD 21 & 22 Features. Kevin Wichmann - Real World Production & Outsourcing, Morph tool, Window tool, Interactive Schedules, BIMcloud & Teamwork, BIMx, 3D Documents, Renovation, Modeling Tips & Tricks, Drafting Tips & Tricks, Favorites & Element Transfer, Views & Layouts, Publishing. Jake Timmons - Structural Analysis in ARCHICAD, Consultant Interoperability, Project Management, Interactive Schedules, IFC, DWG Translation & XREFs, BIMcloud & Teamwork, Bluebeam Connection, Collision Detection, Hotlink Moduling, BIMx, 3D Documents, Graphic Overrides, MEP Add-on, Renovation, BIMx, 3D Documents, Graphic Overrides, Revision Management, Attribute Management, Favorites & Element Transfer, Views & Layouts, Work Environment, New ARCHICAD 21 & 22 Features, Library Management. Ken Adler - Point Clouds, Matterport, Virtual Reality, Window Tool, Interactive Schedules, BIMx, 3D Documents, Renovation, Modeling Tips & Tricks, Drafting Tips & Tricks, Attribute Management, Favorites, Views & Layouts, Work Environment. 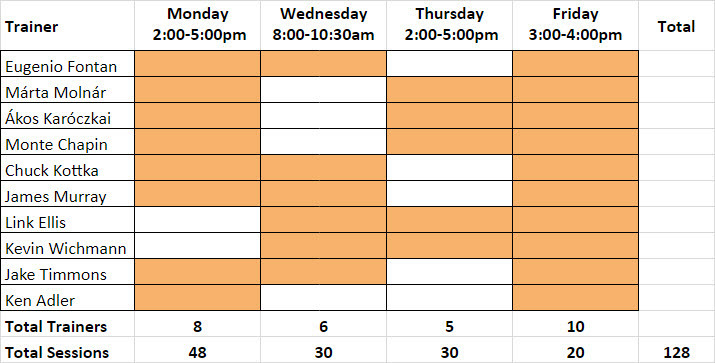 Schedule - The Trainers’ daily availability for ARCHICAD Concierge are shown below in orange. Sessions will be 30 minutes each and start promptly on the hour and half-hour. There are sessions planned for Monday, Wednesday and Thursday (there are none on Tuesday due to the trip to Todos Santos! ), Sessions need to be booked in advance, on a first come, first serve basis. There will be an extra ARCHICAD Concierge session from 3:00-4:00pm on Friday, immediately after the Roundtable discussion. This final session will include all trainers and be informal, not requiring advanced booking. Booking - When making your booking, please schedule one session at a time. As each time slot is booked, it will not be visible for future bookings. Please book the next available session in sequence (ie. if the 2:00pm session is booked, then book the 2:30pm session, not a later session). To allow other attendees to access trainers, please only book one trainer per attendee, with a maximum total of THREE sessions per attendee. 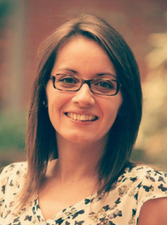 Up to 2 Attendees may join in on each ARCHICAD Concierge session, but no more due to space constraints. More sessions may open up depending on demand. There are further instructions on the booking page. Preparation - To maximize your time, please prepare a list of questions before arriving to the event and have any projects open on your laptop prior to the session. You may need to save as an Archive (.PLA) to ensure you have all library parts required. Please test before leaving your office.